The days are getting longer, and the temperature is rising – yes, folks, it’s taco truck season! 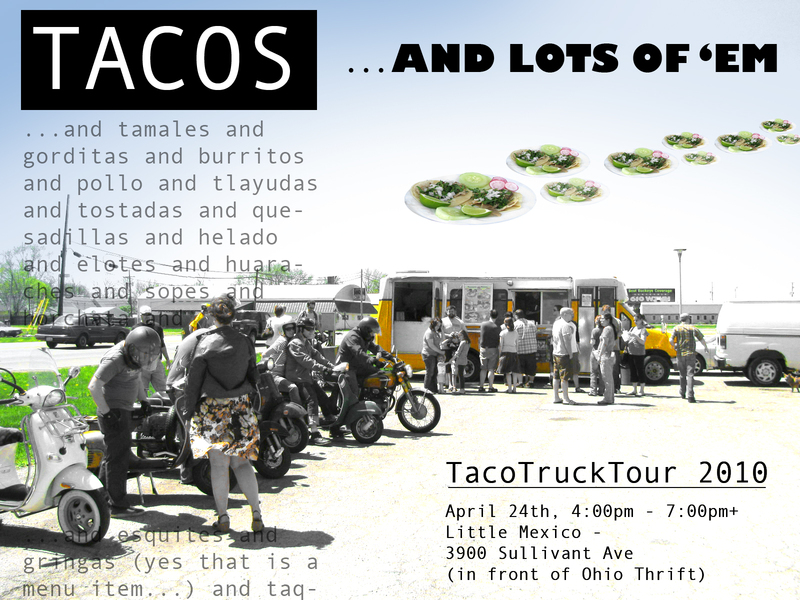 What better way to mark the occasion than to join us on our first Taco Truck Tour of the year? …and much more, including a live mariachi band at Potosinos. We’ll be at the trucks with guidance and advice, and will be distributing maps at the meet-up point. By the way, in case you haven’t heard – we’ve started a new blog called alt.eats.columbus. Not all cultures are inclined towards mobile vending, but an awful lot of ’em are serving up great tasting and reasonably-priced dishes from their native cuisines – mostly in the lesser-traveled parts of our town (where rent is cheap). alt.eats strives to make note of these restaurants, much in the same way that we’ve chronicled the city’s taco trucks. This new project will run concurrently with TTC, and we’d love for you to check it out. Argh! In laws in town, going to the theatre and then Andy’s band has a concert that evening…sigh. I’ll make one of these someday! Ooh, ooh, yeah. Now just gotta make sure the calendar is clear. Went once last year and had a great time and great food.